A clipper system will pass through the region on Tuesday with some light snow. Lake effect snow will develop tonight and Wednesday southeast of the lakes, possibly impacting Syracuse. 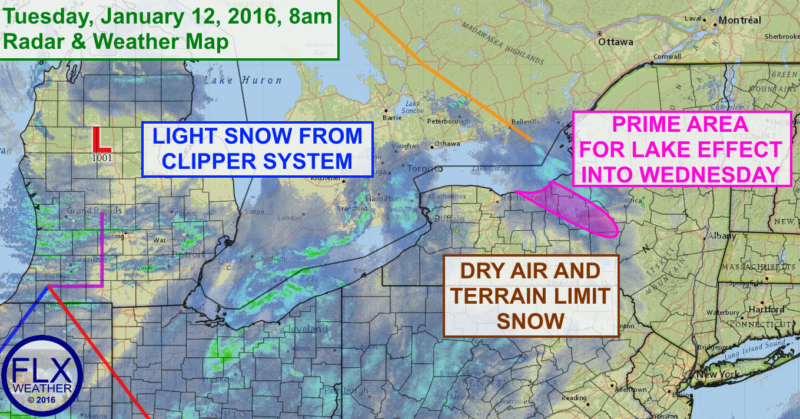 A quick moving clipper system will skirt across the region today. This low pressure system was located over central Michigan early Tuesday morning and will track east through the day. A little bit of warmer air will try to sneak in ahead of the system, bringing highs up to near or just above 30 degrees. This system does not have a lot of moisture to work with. With the snow coming in from the southwest, the higher elevations of northern Pennsylvania and the Southern Tier will help wring the little bit of moisture from the clouds, leaving little left for the Finger Lakes. As a result, on and off light snow is expected today, with accumulations generally an inch or less. Most of that may fall in one or two brief snow bursts this afternoon as the cold front associated with the clipper comes through. These bursts could temporarily make travel slick and reduce visibility. It is uncertain whether or not these will even develop though. Cold air will stream back in on northwest winds behind this system. Lows tonight will be well into the teens, with highs on Wednesday struggling to get much past 20 degrees. Lake effect snow will develop almost as soon as the cold front passes through. With northwest winds, some of the areas that have not seen much lake effect this year will get in on the act. A strong band of snow, possibly with connection to the Georgian Bay off of Lake Huron, will develop tonight across parts of Wayne, northern Cayuga and Onondaga counties. This lake effect band will likely persist in mostly the same areas into Wednesday afternoon. Some areas could exceed a foot of new snow, including the Syracuse area.